You just can't ignore noticing the landing page of a website. It's a crucial cog in your conversion funnel. Get noticed with effective landing pages. 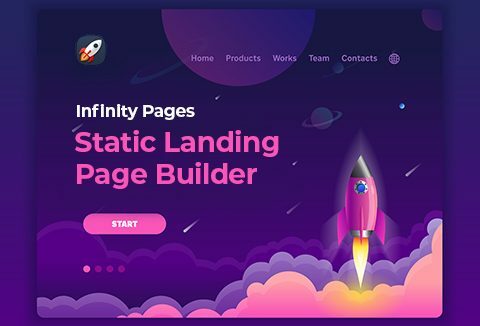 Create them on your own with Infinity Pages, A Modern Static Landing Page Builder with drag & drop simplicity. Buy Now to create compelling landing pages in seconds without spending thousands of dollars. Have A Look At The Demo Of This Landing Page Builder! Build your landing page in seconds with our drag-and-drop builder. Host your landing page on our cloud servers with 99.9% uptime. Possible to export and host your landing pages on your own server. Pinpoint your core visitors and focus on converting them. Choose from a wide range of different designs to suit your individual taste. We have handpicked and carefully designed numerous templates for you to choose from. Rest assured that our templates look beautiful on all manner of devices. Each template has been meticulously tested on a wide range of browsers & screen sizes. What Exactly People Say About Infinity Pages, The Landing Page Builder App? PS: Above Price Plan in the image is the normal prices of Enterprise Plan Per Year. DealFuel is offering a special Enterprise Plan for a LIFETIME at special discounted rates of $25 for DealFuel users for a limited time period. Only one coupon may be claimed by each email address. Each coupon lasts a lifetime. Accounts may not be transferred to another user. Once you create an account it is yours alone to enjoy. Start making your own high converting landing pages within seconds. At A Price Starting From $25 Only! Very simple to use. I understood nothing at landing pages before this. helpful. Thanks a lot. This app was very easy to use. I love it. Easy to use and provides sufficient options to create custom landing pages. Very easy to use and an awesome simple product for my customers that do not need a full website. Perfect app for generating good landing pages.